What might’ve been: the ENB’s Tchaikovsky for kids fails to spark the imagination. Here’s an Easter gift for the children, which has been packed with exquisite care. My First Ballet: Swan Lake is the Godiva of Easter egg treats: classy, gold rimmed (Peter Farmer’s set is the epitome of elegance) and just a little bit old school. It’s elegant and polished, but there’s not a huge amount going on beneath the surface. There’s much to admire here and the young dancers (second year students at the English National Ballet School) are truly accomplished, but I can’t help wishing for something more in the Kinder Surprise range of Easter treats – a bit slapdash, for sure, but absolutely designed with the children in mind. My god-daughter Blue joined me for this show and she really enjoyed some of the scenes – particularly those with a little extra personality, such as the international dance-off at Prince Siegfried’s ball (basically Eurovision en pointe) and the mesmerising movements of the swans as they flutter anxiously by the lake. Blue was rarely bored during this family-friendly version of Tchaikovsky’s classic ballet, and that’s certainly something to be applauded. Hurrah! But she wasn’t really excited either. 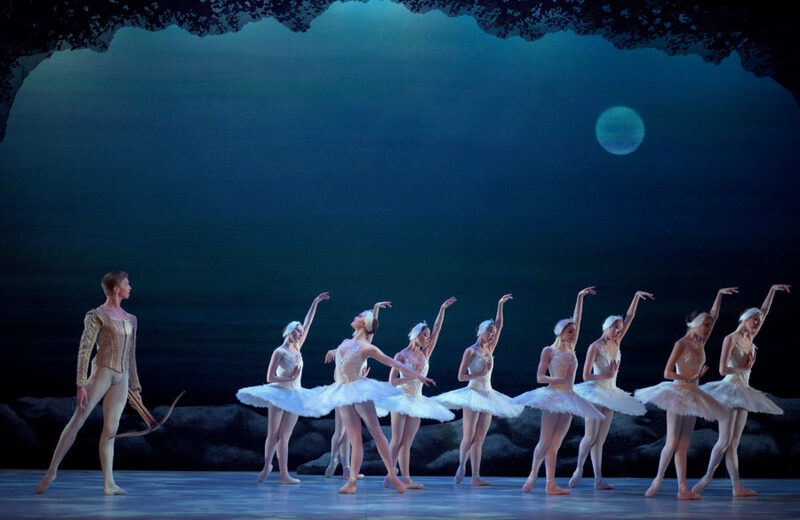 My First Ballet: Swan Lake has been tweaked precisely and thoughtfully by choreographer Antonio Castilla (ENB’s ballet master), musical arranger Gavin Sutherland and dramaturg Lou Cope. When Blue and I watched the Cinderella in the My First Ballet series, the narration cut through the dance with frustrating and unnecessary frequency, but it’s way less intrusive here and is voiced by a modern-dressed narrator (Louise Calf), who sets up the dancing but does not obstruct it. There are still moments when the narration states the bleeding obvious (“He puts down his crossbow!”) but it’s a marked improvement on previous productions. Yet it’s hard not to imagine what might’ve been. Whilst the narrator is dressed in jeans and sneakers, and sounds just like ‘us’ (ish), the rest of the production is highly traditional. Farmer’s set and costumes are wistfully romantic – with lush ballroom set pieces and scenes of sweeping melancholy performed beside the lake – but the production plays out at a safe distance from its young audience. The set is there to be admired, the story to be enjoyed and the dancing (led with delicate authority by Harvey Littlefield’s Prince Siegfried and fluid grace by Chloe Keneally’s Odette) happily consumed. It’s all very lovely and just a little bit easy. At the interval Blue asks me two pertinent questions: “Why didn’t the swans look like swans?” and “Why couldn’t Rothbart be more evil?” They’re brilliant questions that point to a show that hasn’t quite sparked Blue’s imagination or inspired real pulsing emotion. Choreographer Castilla has certainly emphasized Odile’s role here – and the Black Swan duet, injected with such energy by Beatriz Kuperus, is one of the few truly fiery moments in this carefully contained production. But Blue still tells me she wants to be the Swan Princess as we leave this show, which suggests to me that Odile’s story might’ve been pushed much further and her bravery and independence – when she confronts the ‘evil’ Rothbart and saves Odette – pushed centre stage. That might just have been a story that could’ve helped Blue think a little differently and not always long to be the Princess in the tale. Luigi Cifone impresses as the dastardly Rothbart in his black feathery cloak and with his dipping dangerous movements, but he might’ve been a much darker presence. The swans are wonderful dancers but we never really yearn for their freedom, despite the fact that Tchaikovsky’s score is shot through with longing. Thanks to budgeting constraints, the music is piped through the speakers rather than performed by a live orchestra, which is understandable but disappointing. A forte is never really a forte if it isn’t played in the flesh. A feeling of dangerous spontaneity or naked emotion never comes to life, and that feels like a waste. I don’t want my goddaughter Blue to feel safe inside the theatre. I don’t really want her to want to be a Princess. I want her to go to a ballet and feel thrilled and confused, her heart beating madly and her body wrung out. It doesn’t matter if it’s all a bit messy – just as long as there’s a real surprise hidden inside the heart of the show. My First Ballet: Swan Lake is at the Peacock Theatre until April 7th and on a National tour until May 20th. For more details, click here. Miriam writes theatre reviews for Time Out High and her own blog, Sketches on Theatre. She writes about children's theatre for the Guardian and is a senior reader for Sonia Friedman Productions and a Quality Assessor for The Arts Council.